NASHVILLE — Are you ready to cede your body to the global body and to Transhumanist technology under Transnationalists’s control? Or, are you looking for the Trexit? U.S. Secretary of State, John Kerry, recently invited a group of Northeastern University commencement students to see the future with him. As they peered into his crystal ball, Kerry urged his audience to see a world with no nations or borders. Imagine. One world. No boundaries. It sounds wonderful, futuristic, hopeful; like an apple anyone would wish to pluck from a tree. This is the transcendent world vision of the Transnationalists. Transnationalism is a new type of consciousness. Also called Globalism, it is a social agenda, or revolution, grown out of the accelerating technology-driven interconnectivity and interdependence between people and the receding economic and social significance of boundaries among nation states. Free flows of capital and people (legal and illegal) across the sphere of earth is one goal of Transnationalism. The unity of all of the rolling stones of humanity into a monolithic rock is the other. As Kerry noted, hiding behind walls in this ‘new’ borderless world will be impossible. The ‘walls’ reference was a shot at Donald Trump, who wants to build a wall between the U.S. and Mexico. What Kerry did not say is that this wall-less world will happen via technology…which sooner than later will be implanted in our bodies. The technology we now depend on for our very lives in the online world will soon mesh with our flesh and make our flesh and blood lives a transparent and open book. No physical walls will be necessary. The technical term for meshing our flesh with technology is Transhumanism. Not every Globalist advocate is a Transhumanist, but sooner or later, they will realize that turning humans into cyborgs IS the globalist agenda and certainly is the key to its success. If Google, Apple, Microsoft, Samsung, SONY and other mega corporations driving Globalism have their way, this technology will soon come off your desktop and inside your body. Soon equals 2020-2030. Clearly, Globalism offers unparalleled new opportunities matched only by its potential for unmatched tyranny. This is its great danger. Combined with Transhumanism, the results could be catastrophic for humanity. In fact, it is the end of the human race as we know it. WE are the ones who are deciding the future for all of humanity. Many seek a Trexit. Others embrace a Trentrance or the Transhuman/Transnationalist route. One World government and one economy is the globalist’s next “great leap forward” in what the UN calls the “new universal agenda” for humanity that it hopes will be fulfilled by 2030. Called “Agenda 2030”, this far-reaching program was unanimously adopted on September 25, 2015 by the United Nations General Assembly. Its noble goal is to improve the lives of poor people the world over. According to the Agenda, by 2030, the majority of us will cease identifying ourselves with the nationality or country of our birth and will instead get religion and see ourselves as “global citizens” living in the light. Massive redistribution of wealth is the cornerstone of the Agenda. Whether or not the 1% who control 85% of the world’s wealth will voluntarily give their billions away is yet to be seen. Whether or not “Agenda 2030” is a positive development is also yet to be determined. “Agenda 2030” has raised alarm bells among analysts who do not see it as a way for all of us to “love each other”. They see it as a move toward a global totalitarian state. Membership is mandatory. Non-negotiable. It is already a done deal. Some believe this plan can only be achieved by absolute dictatorial power or at the point of a gun. My belief is that no guns will be involved. Microchips will do the job. The UN has already begun giving biometric identity cards to refugees in order to track them as they make their way to their new homes. “Agenda 2030” calls for ALL of humanity to have biometric cards in their hands by 2030. These cards may literally be IN our hands, YOUR hands. This is why Transnationalism and Transhumanism are linked. If we the people do not like the Agenda, now is the time to speak. Britain’s June 23, 2016 vote to Brexit the Globalist EU will have a lot to say about the rise of Transnationalism and Transhumanism across the globe and the fulfillment of the UN’s agenda. America’s vote in November will amplify the feelings on both sides of Brexit. The larger choice here is to take the Transnational / Transhuman path or to Trexit. Socialist Democrats in America have the global body or Global U (a pun on you) of Agenda 2030 in mind. They aim to unify the human body. Their message is “come together”. “Smarten up”. Donald Trump’s popularity is partly attributed to his stand against Transnationalism. Instead of eliminating walls, Trump is promising to build one between US and the World. Donald Trump’s America First strategy is as mosaic as his autocratic lawgiver tendencies and he is wrong about building the Wall, but not completely. Personally, I think we need gates, not walls. Trumps stand-ins are providing further warnings or insight into the possible ‘dark side of the light’ of Transnationalism or Globalism, which they equate with Fascism. Sessions is partly right about globalism being soulless. Some believe the process of globalization will result is a religion-less world. Others think it will lead to greater understanding among the world’s religions. 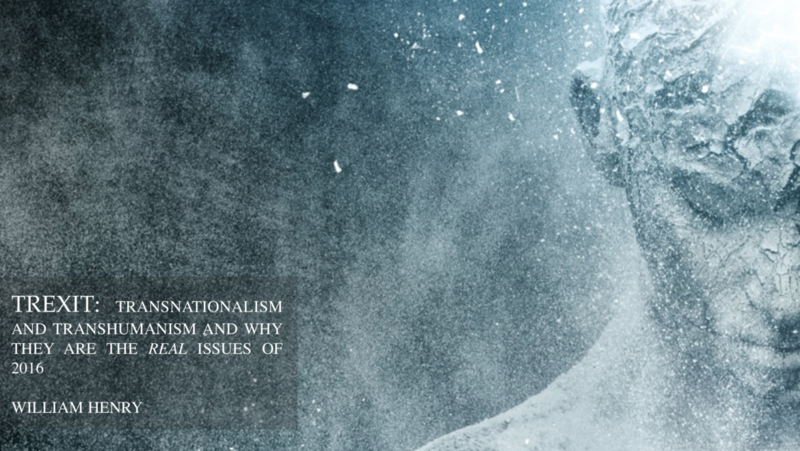 Globalism’s relationship with religion and spirituality is complex. Sessions is totally right about the globalist agenda to treating humans as widgets, which means “mechanical devices”, in the globalist marketplace. For clarity, what I believe Sessions should have said is that ‘soulless globalism’ treats humans as interchangeable ‘smart’ or transhumanist widgets in the world market. ‘Smart’ widgets or things are electronic objects connected to and communicating with the Internet. 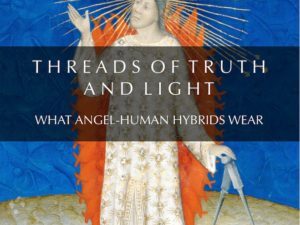 Sessions and Globalists alike must realize that, since 2003, the U.S. Government has been promoting the transformation ofour bodies into widgets via smart technology and the evolution of humanity into a hive mind. This is the core of globalist apple. By ‘smart’ is not meant more intelligent. It means interfaced with computer technology that makes us more watchable, programmable, trackable and controllable. In my 2015 book, “The Skingularity Is Near”, I documented how this smart technology is now in the wearable phase, but ULTIMATELY is aimed at our skin. In the wearable phase body-born devices are being used to augment the human body. These include “smart” watches and sensors. These devices will become less and less about performing functions such as biometric measuring for us and more and more about our identity. These devices will resemble jewelry with an extraordinary array of functions. The ultimate wearable is Google’s proposed nano-nutrient garment that is designed to promote longevity. This robe of many colors will send nano bots into every orifice of your body on missions to seek and destroy pathogens in your blood and keep your arteries clean as a whistle. The result will be dramatically extended life spans. It echoes the miracle garments or robes of power of the ancient gods. 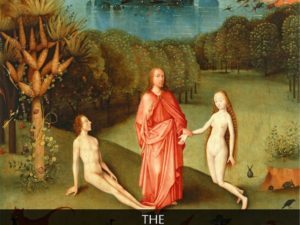 It is the coat of light once worn by Adam and Eve, who were hermaphrodites or two-sexed. The wearable phase will not last long. This technology will shrink in the immediate future so that systems can be embedded or implanted in the body. The smart phone in your hand will sooner-than-you-think be implanted in your ear. SkinTrack, a new wearable technology developed at Carnegie Mellon University, basically turns the entire lower arm into a touchpad. It differs from previous skin-to-screen approaches because SkinTrack requires the user to wear a special ring that propagates a low-energy, high-frequency signal through the skin when the finger touches or nears the skin surface. In another few blinks of the eye, smart contact lenses that will give us super-human vision and will offer heads-up displays, video cameras, medical sensors and more. These are ‘safest’ of these new technologies. Sony, Samsung and Google have all filed patents for smart contact-lens technology in the early months of 2016. By ‘safe’ I don’t mean they won’t have potential harmful effects. Rather, I mean that like other implantables, smart lenses can be removed or inserted by the user. They are not under or in the skin permanently. Google’s Verily Life Sciences is leading the way to bring the IoT to your eyeball. In the new “cognitive era”, as IBM calls it, human beings will hike over to Best Buy, or some other electronics outlet, to pick out your new lens. Your natural lens will be removed from your eyeball. A fluid will be injected into your eye. In a few moments this fluid will fuse with your eye’s lens capsule. As it solidifies your new eye contains storage, battery, sensors, a radio and other electronics. When you leave the store you will now be a transhuman being who will have perfect vision, the ability to see in the dark, sensors to detect blood glucose levels and other applications we haven’t yet dreamed of. Of course, with super vision glasses comes supervision. The great fear is that the implantation of this technology will come at a cost greater than our organic eye lenses. It will cost us our free will and will turn us into emotionless cyborgs. Another Google start-up, Magic Leap, has raised a billion dollars to create an implantable contact lens that injects computer-generated images or floats virtual objects into the real world field of view. Called the world’s most secretive startup, its aim is to bring magic back into the world by rethinking the relationship technology has with people. It’s aim is remove the shackles binding humanity by tossing away the boxes on our desk by uniting the brain and body with technology. Actually, Google may want you to think about eliminating your physical body altogether. Its chief futurist, author Neal Stephenson, is most famous for the concept of “Metaverse” from his 1992 sci-fi classic Snow Crash. Stephenson imaged a virtual universe where users create avatars to communicate and interact. Who needs a physical body when your avatar is so much better? Brexit just put a wrench in that plan, just like the rejection of Google Glass slowed down Google’s aim to control your body, mind…and soul. Transhumanism promises to take the potentials of this right to new levels. Life extension via synthetic organs, drugs and other new technologies eliminate the barriers to our pursuit of life, liberty and immortality. Transhumanism is a human re-engineering project based on the meshing of human flesh with ‘smart’ technology or electronic devices. Born out of NASA’s realization in 1962 that we will not be able to transcend earth in our flesh and blood suits, the U.S. Government began working on the transformation of humans into cyborgs (a term coined by NASA). Transhumanism is aimed at perfecting the human body by seeding it with or ceding it to Artificially Intelligent technology, giving it a new layer of skin, and connecting every human on the planet to the Internet of Things (IoT). In less than ten years every organ and body part will be replaceable by a technological version. These new technologies comprise the Internet of Things (IoT) that drives Transnationalism / Globalism. The IoT is presently composed of 20 billion+ ‘smart’ things or widgets — phones, toasters, refrigerators, cars, computers — that will balloon to over 50 billion such smart things by 2020. The IoT will essentially become an Artificially Intelligent global brain of which each individual human brain is a neuron. How the Internet of Things Will Change Everything-Including Ourselves. Presently included among these things are nearly four billion human beings, who are rapidly shedding all that is human and adopting the transhuman upgrades devised by the wizards of Silicon Valley. If you wonder how dependent, if not addicted, we are to these technologies we are just try to take our cell phones away. Just try to run a One World without them. Facebook founder, Mark Zuckerburg, has made it is his life to goal to have every human being online as a human being thing. Facebook will be the portal or conduit linking all human being things. Hundreds of millions, if not billions, of these present and future Facebook users do not have toilets or clean water. They are the poor the UN seeks to uplift. How turning them into smart things and wiring them to IoT will make them better humans is an, as yet, unanswered question. Ultimately, the “global citizen” view promoted by transnationalism is a transient step toward a trans-earth or multi-planet civilization with transhumans (machine-enhanced humanoids) transcending the boundaries of earth life and coming and going between earth, the moon, Mars and beyond. I am for helping the ‘poor’ to elevate their lives and for transcending the boundaries of earth. But I’m just not sure about doing so as man-chines. 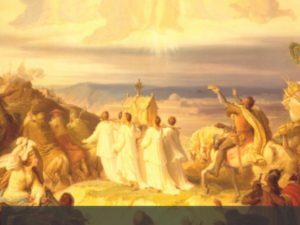 As I discussed in “The Skingularity Is Near”, Transhumanism is the fulfillment of both the Christian prophecy and ethos of a “new”, “perfected” human and America’s “we can do anything with the right technology” attitude. Ever since Adam and Eve were evicted from Eden, humanity has sought to redeem itself and reclaim our original perfect status. Some Globalists and Transhumanists believe our species should embrace our transition to smart human being things as part of our hive evolution and our return to perfection. For them, a new human race connected by implanted technologies is a quantum leap. Others believe this vision is trumped-up. However, human rights advocates, including this author, warn that as technology becomes more and more invasive and merges with us we become and more transparent. Privacy (or hiding) will become impossible. Homo sapiens as a species will cease to exist. In this way, the 2016 American election is a vote for Transhumanism and Transnationalism or against it. Will we make a Trentrance or a Trexit? 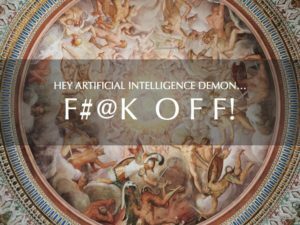 HEY ARTIFICIAL INTELLIGENCE DEMON…F#@K OFF! Thank you for bringing this issue out in the open. I wish I could get everyone I know to read this. I shared on my FB page, and hope that some will find it. There is nothing more important at this time, than to spend time raising our vibrations. Meditation and taking care of our bodies and minds is critical. I do not know if we humans are going to survive all of this that you speak of, at least on the physical level, but hoping that a large number will choose to keep their souls through natural ascension, rather than cyborgism. The entire thing seems so insane it’s ridiculous. And yet, a large majority of people do not see it that way, sadly. I wish to see this article front page of the “Times” newspaper, magazines and 6 o’clock channels broadcasting worldwide. Thank you! This is just a brilliant article, thank you so much! I am happy, you have merge this article together in the most articulate way and also greatful, totally. I was seeking to provide information on the internet about this after I been watching The next humans Education by Ancient Aliens on my DVR recordingS. However didn’t come across you until after… I’ve thank you I couldn’t of had expressed it any better. God be with us and God Bless you..
as from that negative term comes the name…………. (are you ready?) TRUMP!!!! I find that quite hilarious! Thank you again William for my enlightenment through your research and words. Patricia S. in Glendale, Ca.